Today we are taking a look at one of Icemat's new headsets, the Siberia In-Ear Headset. 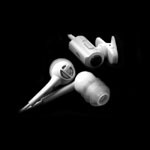 The Siberia In-Ear headset is designed to be used with VoIP and other digital devices. The headset includes unidirectional microphone, and includes three distinct ear coverings that can be changed out to fit different ear sizes. This design will allow the user to keep sound at a safe level without having to sacrifice the audio quality. Headset LED mod / customization?